Cool fish, right? I hate when the pics I use at the start of every blog post are imperfect, but the sharp contrast of the orange jig head almost works here. Sculpins are awesome. Greenling are awesome. Blennies, which sort of look like a cross between the two, are also awesome. Few fish will try to bite you, but blennies, found in warmer temperate and tropical waters all over the world, are one of them. Their size means nothing to them, and these relatively small fish will often bite or try to bite you if handled. 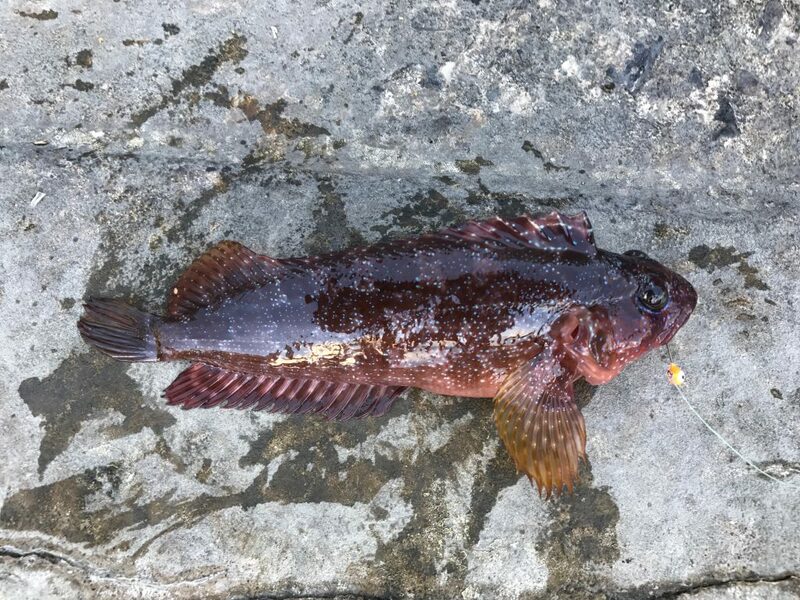 The deep red Largemouth Blenny I captured were beautiful fish and arguably the most surprising fish I captured fishing the Dana Point Marina. Unlike the highly-visible Opaleye and Salema, these blue-speckled red phantoms zipped in and out of the rocks with surprising speed, and I never saw them coming. The two I caught were hard to handle, and I had limited space to work with, so I only got one picture before the writhing beast got free. It bit me, but it was surprising more than painful. Read the next entry in #SpeciesQuest here: Species #105 — Garibaldi.